By only walking the Cotswold landscape will you discover ancient tracks of the drovers and salt ways, neolithic burial sites, iron age forts, ancient wool churches, deserted villages, ruins of a byegone age and ancient beech & oak woodlands not to mention hidden meandering river valleys. Discover the Cotswolds set amidst gentle rolling countryside and enjoy Somerset with its picturesque Mendip Hills.Also the beautiful Wiltshire Downs and its heritage together with the contrasting scenery of Exmoor with its coastline, heather moors and wooded combes. 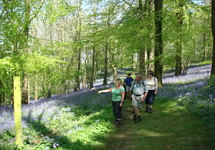 The beautiful area of the West Country has so much to offer the independent walker with its contrasting scenery. Some of our walks encompass the City of Bath, which offers some of the finest architectural sights in Europe with the Roman Baths, Bath Abbey and the famous Georgian Royal Crescent. As you leave Bath via the Kennet and Avon canal and travel on into the Mendips you will be pleasantly surprised by the beautiful countryside of the area and the fascinating heritage. The Cotswolds, is an area bounded by Bath, Oxford and Stratford-upon-Avon and is world famous for the beauty of its towns and villages. In scale this varies from modest cottages to imposing manor houses and impressive churches both large and small. Gently undulating hills and tree lined valleys allow the walker to appreciate and enjoy the distinctive character of this inviting countryside.